Anya, Mado, Munny and Elephant at the Womanthology booth at San Diego Comic Con. The Womanthology “tour” continued to rock. Mado and I had a terrific time at San Diego Comic Con. The response to Womanthology again was amazing. The panel was packed, and our group signing at the IDW booth included about 30 artists and writers, the largest gathering of Womanthology creators at any con. 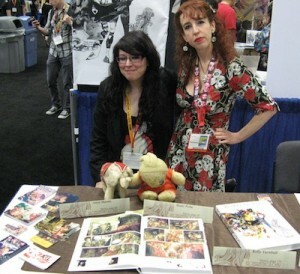 It was inspiring to meet so many talented women in comics, plus hang with Mado, who had never been to the USA before! Some downtime after New York Comic Con with Leanna Renee Hieber. The momentum continued to Dragoncon, where I participated on a great panel on women in comics — both as characters and creators — moderated by Angie Bagley. Afterwards I sold out of all my Womanthology copies! In some ways, New York Comic Con felt even more crowded than San Diego, perhaps because comics there are the main draw rather than movies and TV. Womanthology did not have a table, but I participated again on another panel in a large almost standing-room only room. I also had more than ample opportunity to connect and get advice from lots of pros in the field. One of the best parts of all the comics cons this summer was reconnecting with creators with whom I had worked with during my Tundra and Marvel Age days such as Kevin Eastman, Kent Williams, Scott Hampton and so many more. 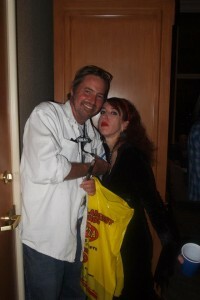 With Edward Lee at Killercon 2012. 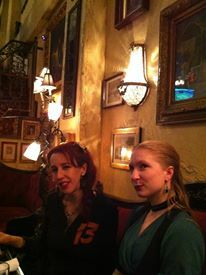 In fall 2012, I also hit Killercon in Las Vegas and World Fantasy Con in Toronto. Killercon is a fantastic small horror convention where most attendees are writers, editors, publishers or artists. It was great reconnecting with old friends such as John Skipp, Jack Ketchum, Edward Lee, Brian Keene, Ross Lockhart and William F. Nolan. There was also a substantial Bizarro presence, including Carlton Mellick, Jeff Burk and Rose O’Keefe of Deadite Press. The dealers room was almost all books–a who’s who of the cutting edge of small press publishing. Killercon had only one programming track, but that meant that everyone was on the same page — and ultimately at the same party. The Gross-Out Contest was lots of stomach-churning fun. And well, I’d say more, but what happens in Vegas… Unfortunately founder Wrath James White has had to call an end to Killercon, but this was one of those cons where you left feeling like you had hung out with family. Not your blood family but your tribe. 2 Responses to The Womanthology Tour Rocks On and a Killer Con! On and a Killer Con! | Anya Martin is the finest. Thanks so much, Jess! Apologies that the site didn’t send a notification and I missed your message until now.